This is about a ‘thing’, but it is about more than the ‘thing’. I do realize it is not normal behaviour to name a kitchen appliance. Not normal at all. 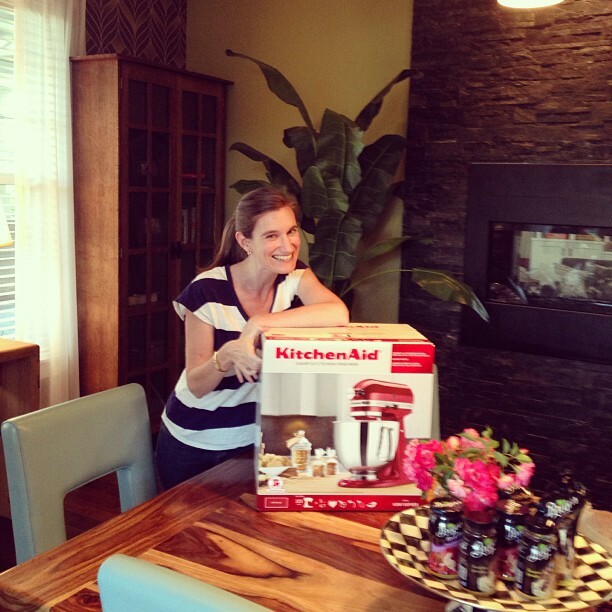 But here’s the scoop – I welcomed a brand new KitchenAid mixer into my family last night. And her name is Rosa. For the last four and a bit years I’ve had my eye out for a stand mixer. You see I do a lot of baking and once we moved to America I realized the huge difference in price in mixers here….just under a thousand dollars in NZ dollars for the very same thing that I got last night. More than three times the amount it costs here in America. So for the last four years I’ve been entering every competition I could see on blogs to try to win one. For a while there I would tweet sometimes daily to @KitchenAidUSA, sometimes weekly. Just crazy little comments along the lines of ‘I still have a KitchenAid mixer sized hole in my heart’. I would have friends send me links to competitions. I would write silly facebook statuses along the lines of ‘KitchenAid mixer – the perfect Father’s Day present’. But there was no way I could ever justify buying one for myself. I was a little over the top I know. But it was fun. Last night I was invited up to a friend’s house under the guise of ‘cleaning’ in preparation for a new baby’s imminent arrival. Yeah well that house didn’t need no cleaning. Already spotless. Instead the kitchen was full of a bunch of amazing friends who had gathered for a bit of a ‘do’ and to present me with my very own ‘Rosa’ – a shiny red mixer. Now while I will love using this appliance and will use it all the time – like ALL the time – at the end of the day the mixer is just a ‘thing’ I know…and the meaning behind receiving this gift is more than just being gifted a very handy appliance – that I may or may not have harped on about for over four years…. For me, Rosa will sit on my kitchen counter for years to come and serve as a reminder of just how faithful our Lord is. Moving to America has been tough. Settling here has not been all smooth sailing. But we’ve persisted. And God has blessed us tremendously. God has been so very faithful. Every step of the way. In the good times and the bad times. He has been our strength. Three years ago I never dreamed that people would gather in a beautiful home, one summer’s night, to bless me with a gift – a gift that I can use to serve others. To bless others. Two years ago I never dreamed that would happen. But in the midst of just getting on with life, and reaching out and initiating and just being real and raw and learning to not hide who I am……..relationship has happened. Lifelong friendships now exist. ‘Community’ has happened. Not because of me. Because I say stupid things and I have fierce and strong opinions, and I second guess myself all the time, but IN SPITE of me – God has been so very faithful. Those words in Matthew, they are a very special promise. To be perfectly honest with you, it isn’t the funnest thing in the world to yard sale a lot of stuff, a lot of stuff you actually use and are gonna have to replace once you move countries again. It isn’t the funnest thing in the world to realize one day you have plenty of friends with kids your baby’s age, but hey, that tween, that tween of yours is seriously lacking in the friendship department and you failed miserably in that area. It isn’t the funnest thing in the world to say goodbye to family and friends – and to miss special events, for years on end. But God is faithful. He does promise that if and when we give up ‘things’ and proximity of relationships for His name’s sake, for ministry purposes, then we will receive many things in return. According to His purpose. Whatever God is asking of you – be assured, He does provide all we need – as well as things we don’t actually need. Like a mixer. If you are being called to do something for His sake – he will not abandon you. His will = His bill. The very fact that I’ll be sad to leave friends behind when we leave in three months time is a very good thing – again it shows the Lord’s faithfulness. If I left and I wasn’t going to miss anyone – then that would have been a terrible shame. And for me, right now I can see the Lord’s goodness – represented by a shiny red mixer. Others may see a powerful kitchen appliance that will churn out whipped cream in a flash and make the best pavlovas, but not me. I see it as a symbol of God’s goodness. That He cares about the details of my life. He wants to bless us – abundantly. And friendships matter. They really do matter. I wasn’t part of Rosa gifting, but so remember you getting it and feel the joy of it still, and the meaning behind her. Great post. Also, what a great table she’s sitting upon! Praying life is great for you!